My wife or I have been on the Nebraska Chapter’s Board for a few years now. Back in 2016, we decided to go to the Leadership Conference in Estes Park, Colorado. 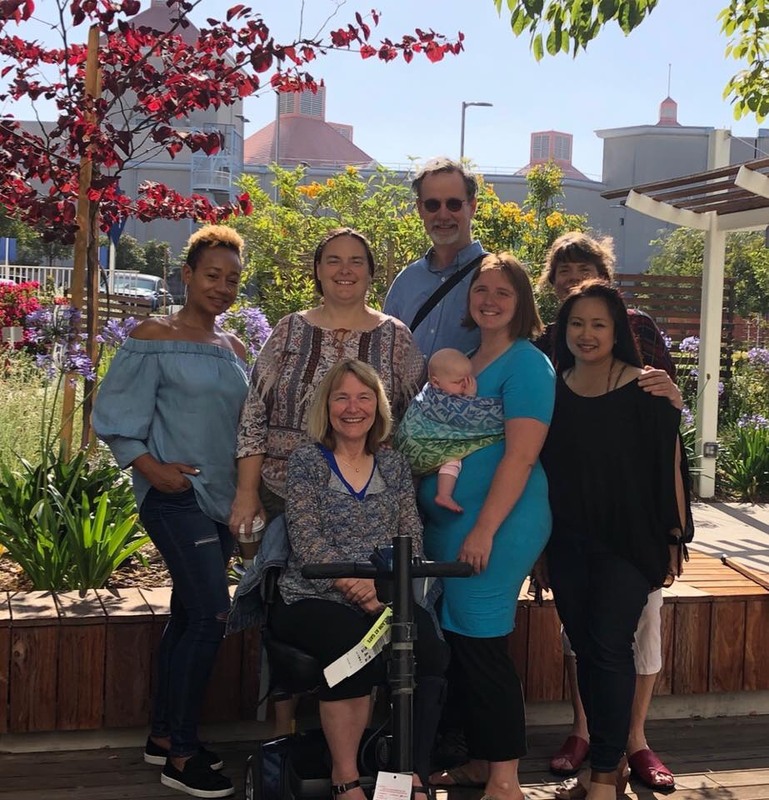 We networked with people from all over the Midwest and from all over the country: parents, deaf adults, medical professionals, and teaching professionals. It was great. They covered all manner of topics from technical updates, to building stronger Chapters, to legislative highlights, to restorative self-care classes, and yes, there were some touching moments that pulled a few tears. Let me stop a moment and say, if you are reading this, you are likely a member or are supporting Hands & Voices. (Soapbox: On) Consider becoming involved with your local board of directors. 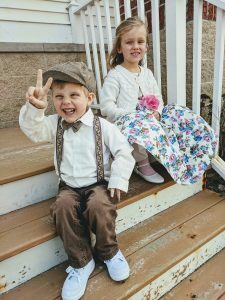 These are usually a bunch of cool parents, cool professionals and cool deaf adults that want to help other parents of deaf and hard of hearing children in some of the unique challenges we face from day to day. Someday you will have the opportunity to go to an amazing event like the Leadership Conference. It will have a positive affect on you as a parent. (Soapbox: off). Disclaimer: I am not cool. 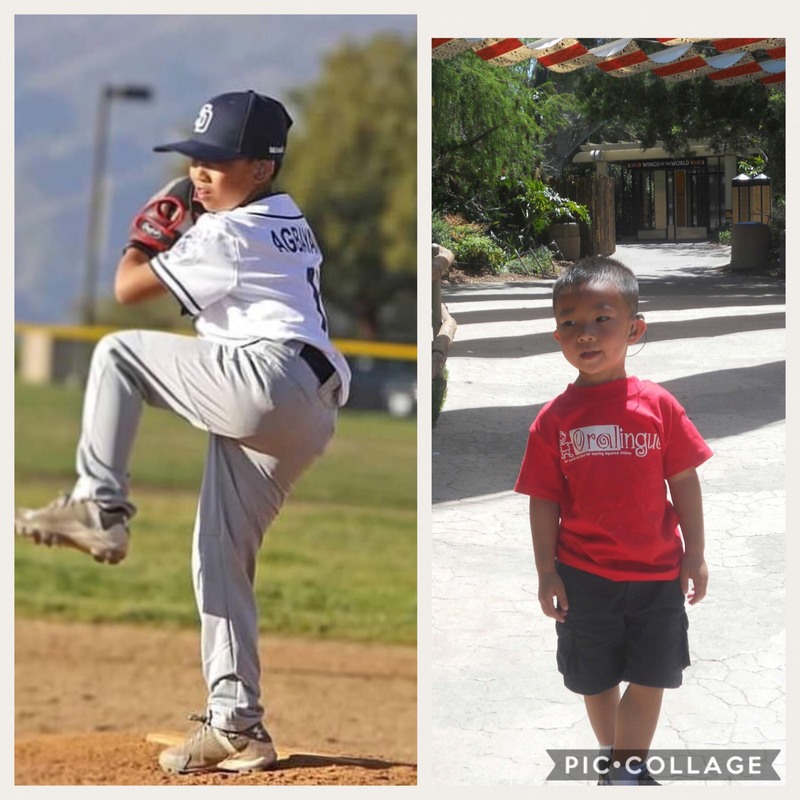 We started this journey when our son was born hard-of-hearing in 2007. Due to trauma during his birth, some of his fine motor skills in his legs, arms, including his finger and hand muscles and some of those in his lips and tongue are affected. Like all of our children, Charlie is a blessing and has changed our lives in wonderful ways. But for Charlie, and even for our other three children, we don’t know what the future holds. Like I said earlier, we don’t know what the future holds for our kids. I’ll be honest; I was more worried about Charlie graduating from high school. On the way home from the conference, I was really in my head. “What can I do? What more can I do?” My wife and I work full time, which sometimes require travel and extra hours. We also have three other children. I am blessed to work for an employer that gave me the opportunity to go from a 40-hour work week to a 32-hour work week. First off, shaving 20% off the family budget was difficult. But it gave me the time to become more familiar with Charlie’s school friends, school staff and curriculum. A friend was teaching a chess club for third through sixth-graders at Charlie’s school, and asked if I could assist. I know more about Gallaudet than I do about chess, which means “not much”. I said, “Sure. 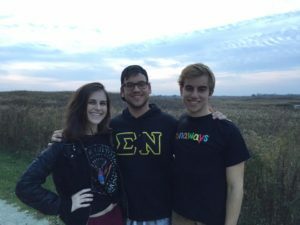 Can Charlie join?” He said yes, and two weeks later, I was helping teach chess and chess-related signs once a week to students in the club. In the spring of 2018, Charlie played in a school chess tournament and had a 2-1-1 record and did pretty well. He wants to play again this year. That probably wouldn’t have happened if we hadn’t thought about working toward college and taking the leap to lower my work hours. Next year, Charlie transitions from elementary to middle school. Our department of education closed our Nebraska School for the Deaf many years ago. We are faced with various blends of mainstreaming through middle and high school. As parents, we do not feel Charlie will have much success with this approach. So our next big adventure may be obtaining residency in a state that has a school for the deaf. Maybe in six years, I’ll write an article on how to get your Deaf Plus child into college. In the meantime, I look forward to the moments that will change the course of my family’s life a little bit, just like the Leadership Conference did for me. Those moments opened a multitude of doors that have provided experiences for Charlie and me that we never would have had…experiences that make the unknowns ahead less daunting. 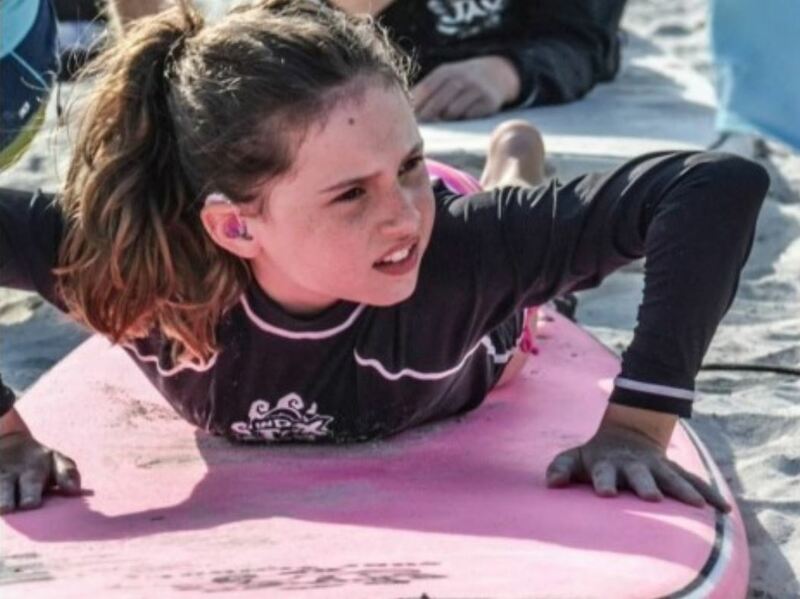 My name is Ashlei Powell and I have bilateral cochlear implants. 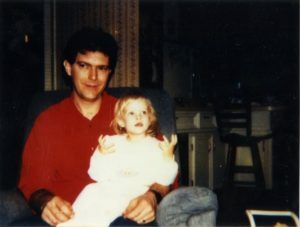 I became deaf at eleven months from meningitis and received my first implant, on my second birthday, in 1990. 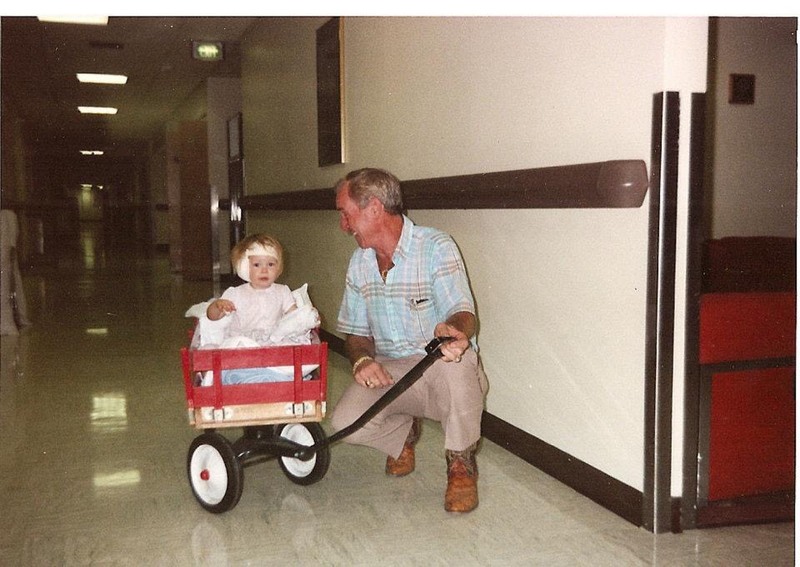 I was the youngest recipient in the USA (just after FDA approved the cochlear implant for children) and the first youngest, in the world at the time, to receive a cochlear implant. 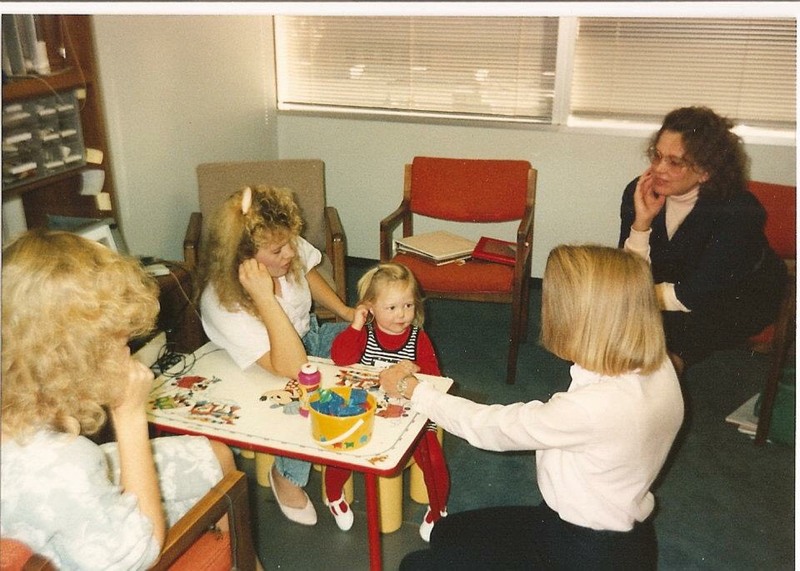 After receiving my first implant, I attended speech therapy for several years to learn how to listen and speak. Growing up, I had the opportunity to speak about my hearing experiences at auctions, in news interviews, and even with the first deaf Miss America, Heather Whitestone. 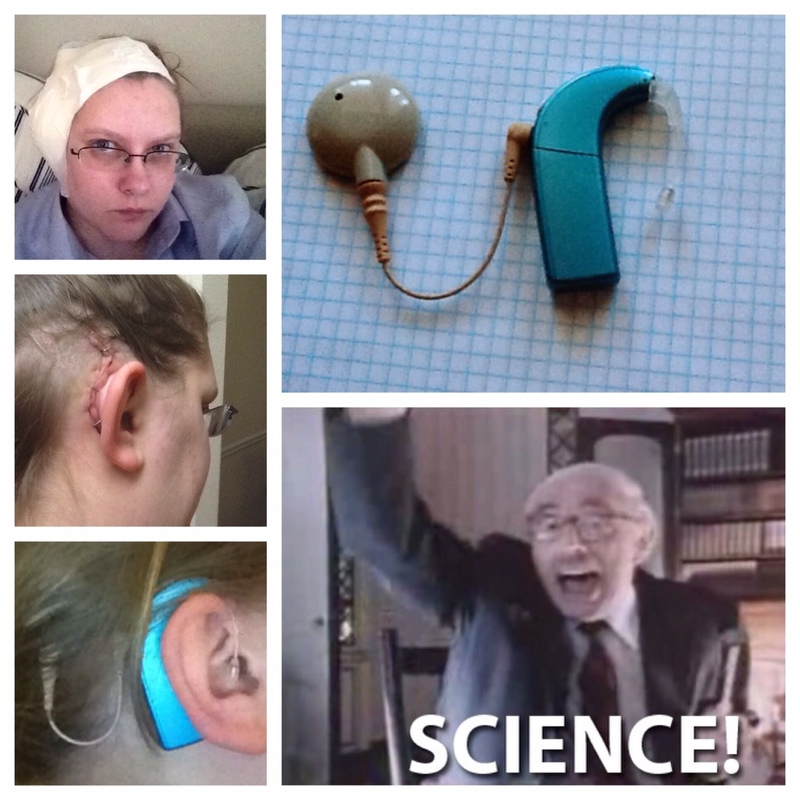 After fifteen years of wearing just one cochlear implant on my right side, I felt like I was missing a puzzle piece. In 2005, I received my second implant and it was indeed, the missing puzzle piece for me. I attended Pensacola Christian College in Florida for three years, before coming back home to marry my college sweetheart, Joe. We are proud parents of two dogs and a spunky and sweet two-year-old boy, Jackson. My life has had a few challenges, but has been incredible and full of blessings. 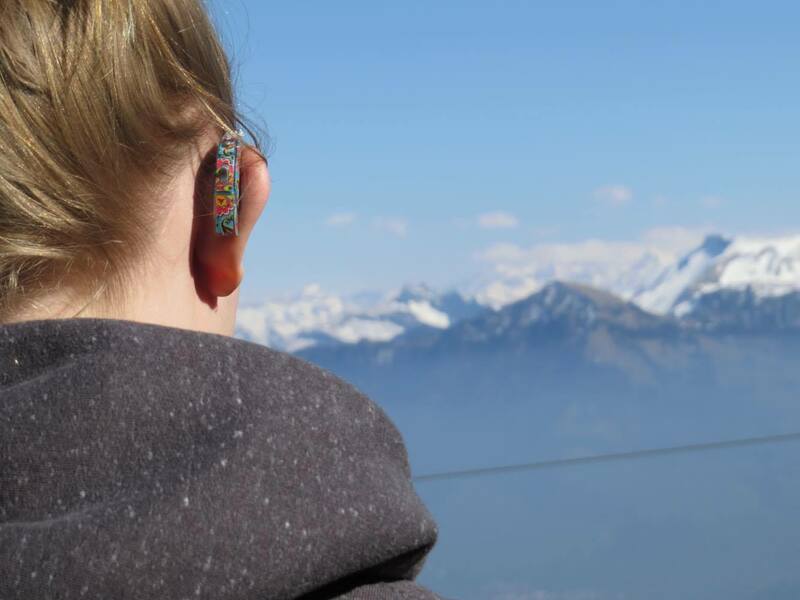 As being a Cochlear Implant recipient, I had to find ways to help me listen in life and in school that would work best for me. I made it work and accomplished a lot. I love being a bilateral recipient and I enjoy sharing my story to help others who are considering cochlear implants. I have always wanted to be a nurse, but it wasn’t what the Lord wanted for me, so I tried a few classes in the medical field to see where the Lord wanted me to go. I’m now currently working as a phlebotomist at a hospital, running my own Deaf Wearables business, and also being a mommy and a wife. 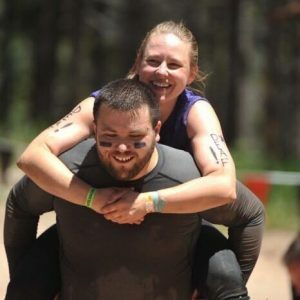 In summer of 2017, I participated in a physically challenging obstacle course at Copper Mountain. I looked everywhere online for outer wear that showed I couldn’t hear…..something I could attach or could wear on my clothes, arm or headband that said the word, “deaf”. There was not one single thing out there and I thought it was so frustrating and not fair to the deaf community. I recently started producing of all kinds of Deaf Wearables for all ages, that can be used in all kinds of activities such as skiing, marathons, hikes, walks, etc., even daily life. The reason why I have a line going through the ear is because it’s very simple and produces a quick understanding, like the universal symbol, to let people know the person can’t hear. I wanted to present this collection of wearables in a fun and inviting way. I know how hard it is to do everyday activities without people being aware of someone’s deafness. My products contain: reflective vests, shirts, neon headbands, key chains, bags, stickers, etc. that have the word, “deaf” on it. 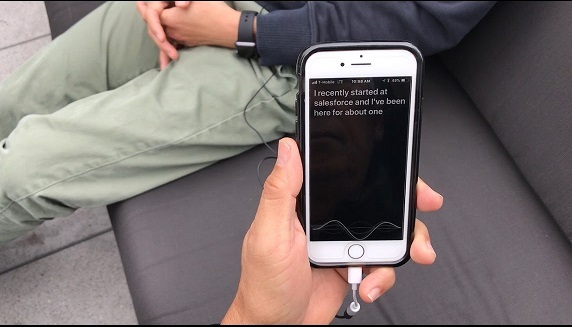 My goal is to produce deaf wearables that people would be excited and proud to let others know that they’re deaf–all while being fashionably current. Most recently, we have been asked to clarify our position on parent choice. Supporting parents in making their own informed choices for the child they know best is central to everything we do. 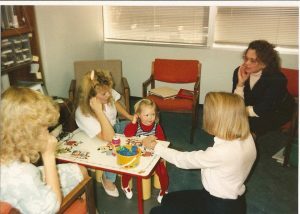 In my very first job right out of college, I informally took on the role of being a mentor to a family with a toddler who was deaf. I had no formal training, other than my own experience of growing up hard of hearing, becoming deaf as a teen, and learning American Sign Language shortly after. 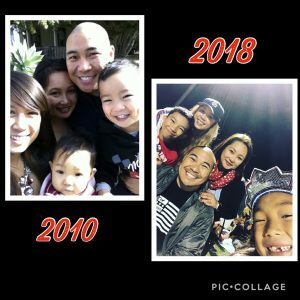 That first experience of working with families was so enjoyable for both the family and for me that I began to get calls from more and more families. I happily provided mentoring support, even though my primary job was structured toward independent living for teens and adults. A mom called to ask for support services and resources. 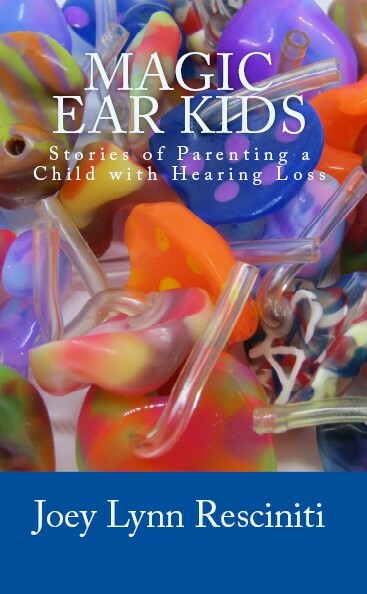 She had just found out her six-month old daughter was deaf. I debated whether to take the appointment, for I had just turned in my resignation letter to stay home with my own newborn baby. Since the family lived near my home, I took the appointment. I ended up mentoring that family on my own out of sheer passion for the work. We held sign classes in her home and the neighbors joined in. We mentored other families together. In an ironic twist, this mom was also there to support me when my toddler became profoundly deaf two years later. 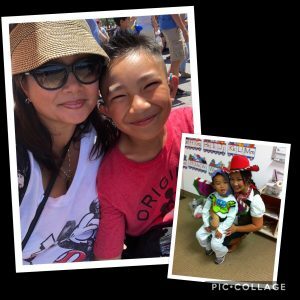 It was that moment that my journey became personal–now I was the mom of a deaf kid. 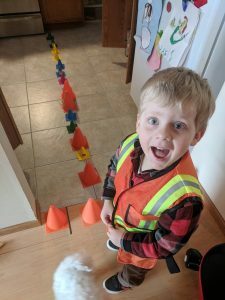 Everything shifted in the way I provided support from that point on, because I was now walking down the parenting path with my own experiences. My husband and I were now facing the process of choices and decisions we had to make for our child (and the two that followed). As a parent, we are responsible for all kinds of decisions for our children. My husband and I soon learned that NOT making a decision was a decision in itself–and we had to own the consequences of that path as well. In 2004, I stumbled upon Hands & Voices while putting together a website for parents in Illinois. The minute I read the description of the organization, I knew it was a fit for our family. Who are we? We are parents of ASL signers, cued speech users…. parents of kids with cochlear implants or total communicators… we are people who have common interests connected through the community of deafness. Hands & Voices is a safe place to explore options, get unemotional support (although we can be emotional about it! ), learn from one another and share what we have in common. We value diversity and honor the role of parents and family as the single greatest factor in raising a WASK (our favorite acronym: Well-Adjusted Successful Kid). Hands & Voices is a nonprofit, parent-driven organization dedicated to supporting families of children who are deaf or hard of hearing. We are non-biased about communication methodologies and believe that families can make the best choices for their child if they have access to good information and support. Everything about the organization matched what I felt was most needed. Parent choice. 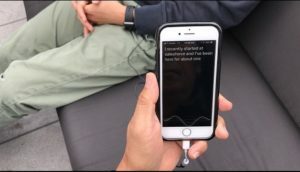 Support for diverse communication options. Coming together for common causes. Support by parents for parents on the parenting journey. 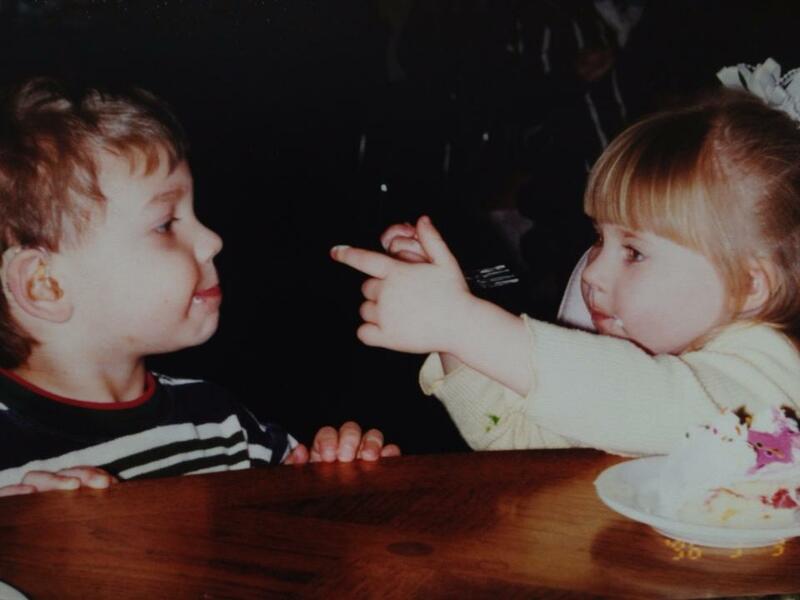 It is now many years later; my kids are now young adults. I’ve been a board member, a founder of a state Hands & Voices chapter (along with the parent I previously mentored), and I am now working as staff. 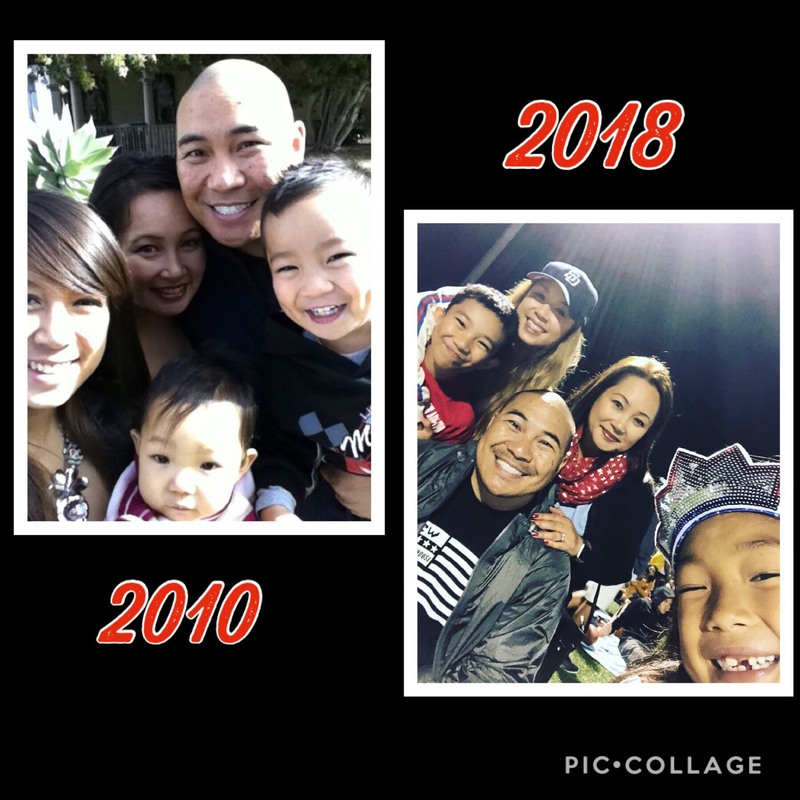 Through the years, we’ve remained steadfast in our mission and vision to provide support to parents on the journey. We work with a diverse group of parents from all walks of life and all different stages of their journey. Parents not only have the right to choose language and communication modality for their child who is deaf or hard of hearing, they have the ethical, legal and moral obligation to do so. Furthermore, the research proves that the single greatest indicator of a DHH child’s eventual success—regardless of which mode or method of communication is used—is the meaningful involvement of his or her parents. The goal is to make that involvement authentic, effective and informed by the wisdom that so many have to share from direct experience…parent-to-parent, deaf or hard of hearing adult to parent, and professional to parent. The parenting journey is filled with twists and turns. As a mom of three kids, I’ve experienced this firsthand. 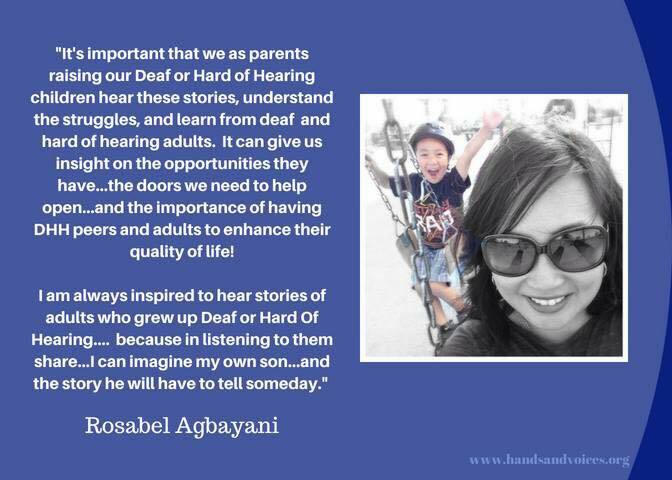 As a Deaf Mentor in early intervention, I’ve had the honor of being a part of a family’s journey often from the beginning. As a staff person with Hands & Voices, I’ve had the opportunity to work with a variety of families negotiating this journey around the world. I’ve seen it time and time again–even in the midst of difficult situations and trying times–there’s so much more that unites us than divides us. We must continue to focus on the common goal: building an informed community surrounding parents so they can nurture the seed of potential in every child. 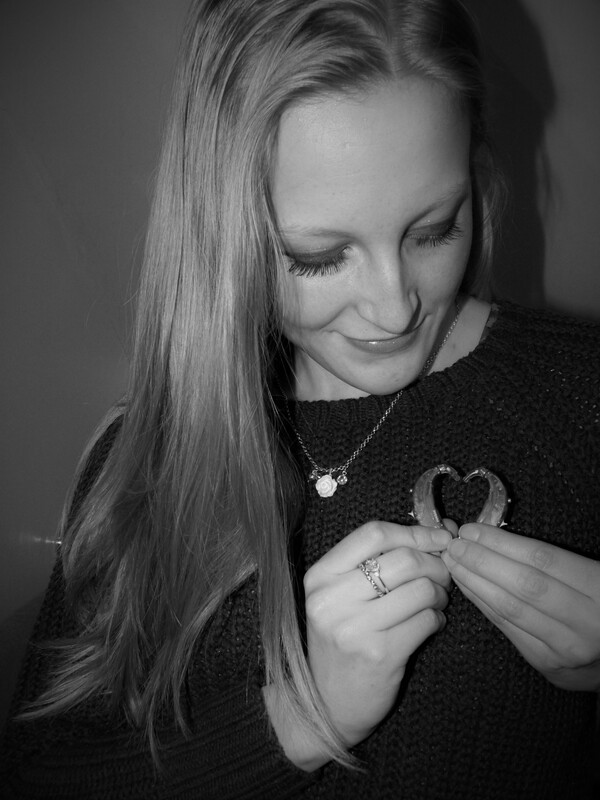 My name is Ellie Parfitt and I’m known as The Deafie Blogger. 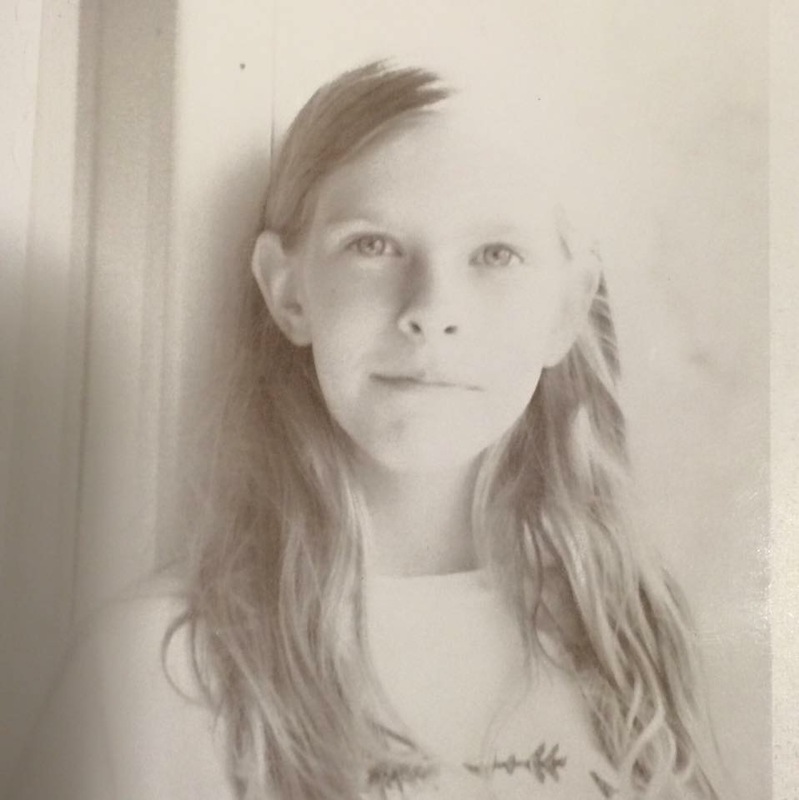 I was born with a bilateral profound sensori-neural hearing loss, into a hearing family who had no experience of deafness. 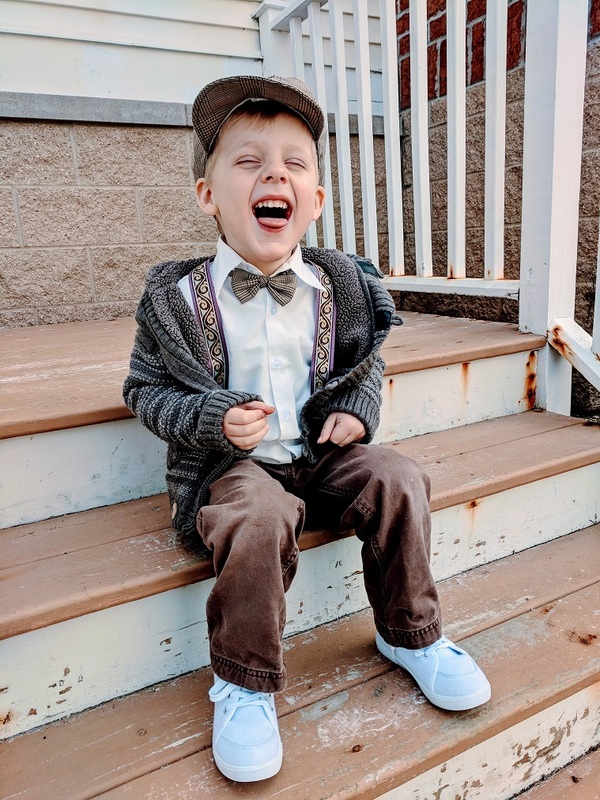 It wasn’t until I was 9 months old that I was diagnosed, and I received my first hearing aids at 10 months. My family decided to try and teach me to speak, rather than sign language because they had no knowledge of deafness or family members who were deaf. They didn’t receive much advice on communication choices. My Mum was struggling with the diagnosis, even to the point of not accepting it, so speech to her was the only choice at the time. Nowadays, there appears to be a lot more information, so hopefully a family can make an informed choice, what is best for the child and the family. It was only years of constant repetition, support from my Teacher of the Deaf and Speech Therapy sessions that I’ve managed to get my speech to where I am today. I attended mainstream Primary and Secondary School. 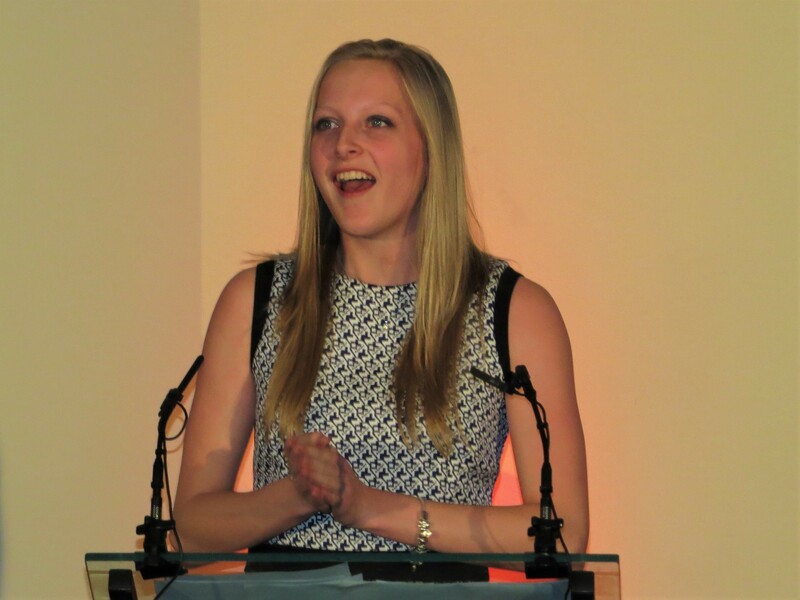 I was the only deaf girl at school, which meant engaging with my hearing peers was difficult. I was a fun, sociable person and was always up for making new friends. However, being among hearing teens meant that society was quite judgmental. There were times that I came home from school upset, because my friends left me out of group conversations. My amazing Mum kept telling me that they’re not worth it, and to focus on school work and they might not be the right friends for me. Although I had a Learning Support Assistant/Notetaker at school, all the time after school and at weekends were spent catching up on school work and going over things I didn’t understand. Eventually, all the hard work and determination pulled off and I am so proud of the grades I achieved, including top grades in German and Media Studies. Looking back, I’d love to tell my teenage self that all that work has paid off and those so-called ‘friends’ weren’t worthy of my time or friendship. Now, I have jobs that I love and true friends who actually care about me and are accepting of my deafness. In 2015, I became quite frustrated of life with a hearing loss, the challenges and obstacles that I kept facing. 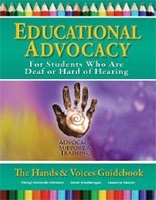 I was looking for other deaf role models to see if I could read anything to help me, but I couldn’t find that person. I also desired somewhere to express my thoughts, so my boyfriend suggested writing a blog. That’s when ‘Deafie Blogger’ was born. I write about my life as a deaf person, different experiences and challenges that occur, and how I overcome obstacles. 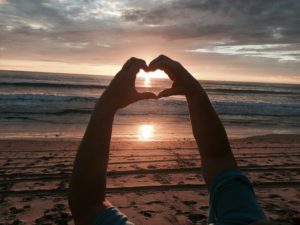 I noticed that people were commenting on my blogs of how they could relate to my experiences and that they were glad they weren’t the only one. This motivated me to keep on writing and inspiring deaf people. I got invited to deaf events and presentations, and I realised that some deaf people were signing to me, but I didn’t understand what they were saying! I was then intrigued about the language and I joined a class to start learning British Sign Language. Even the little signs I know, I’m able to have a small conversation with some people which is quite rewarding. As well as working in Marketing and blogging in my spare time, I love campaigning for deaf rights and raising deaf awareness everywhere I go. 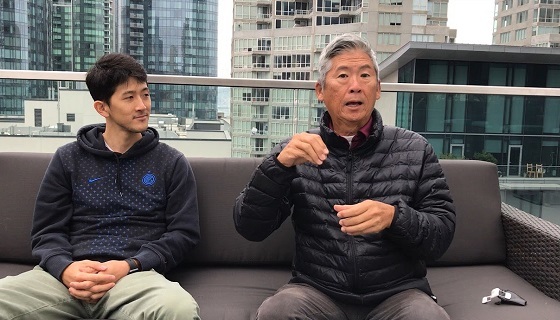 When my father was diagnosed with prostate cancer, I didn’t give it much thought. The prognosis was very good and the treatment was quick. My three deaf and hard of hearing kids were pretty young at that point and I actually waited to share the news until their grandpa was well into treatment. There were a few questions which I answered and life went on. The second time around, my dad was diagnosed with Stage II Esophageal cancer. This time, the kids were teens. So from day one, they were involved and informed. We were optimistic that the cancer could be contained. My dad, a former Marine and World War II vet, approached chemotherapy like a war and hunkered down for the fight. The following year, a PET scan and blood work came back with good news: the cancer was in remission. Denial isn’t just a river in Egypt. It’s a coping mechanism that kicks in when you’re not ready to face what’s happening in front of you. So we kept paddling down that river. Of course, I didn’t tell my kids what we were facing, because I was deep into denial myself. 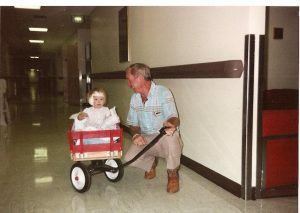 My dad was in a wheelchair at this point and we had a hospital bed set up in the family room. The kids started asking questions to which I had no answers for. How long will it take for him to be able to walk again? When my brother and I took my dad to the doctor, reality finally hit. I cornered the doctor in his office and asked him how much time we had left. The only way to tell the kids was to gently but clearly tell them the news. I don’t even remember how or what I said, I just remember the sad looks on their faces as the reality hit them too. They had never experienced the death of anyone close to them and this was all new. 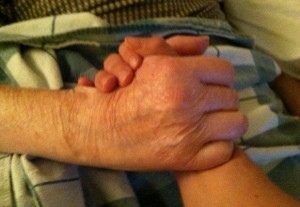 As painful as it was to see my own kids grieve and cry, I stopped trying to be the “strong one” and just broke down too. Expressing what you feel is an important part of loss. Our greatest danger with handling the emotional pain comes from stuffing it inside and pushing it away. 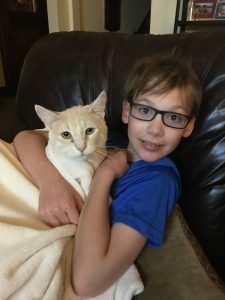 Deaf and hard of hearing kids–any kids–need to see what we feel. The healthy thing to do is to feel every aspect of it–let it out, let it flow. Go into the pain, instead of away from it. When kids see their parents handling life from a place of raw emotion with recovery, they too, learn that it’s okay to feel, to express, to reflect. One of the most helpful things for my kids to get through the loss of Grandpa was to reflect on their best and funniest moments with him. We sat and shared stories. We also talked about the dark times as well. Anything and everything was on the table to be asked. Of course, depending on the ages of your kid/s, you’ll need to adjust your language in a way they can understand and process. Death and dying tends to be a subject we want to dance around. Instead, be upfront with your kids–see it as part of the celebrating of life, the imprint of one soul on this earth. As I stepped out of the car, my feet felt the sand. It seemed to express a revolt from my sandals as it gathered on my feet and wriggled underneath them. The sensation was so foreign compared to the sand-less climate of Pittsburgh that I had grown up in. The sand had demonstrated an abnormal desire to worm its way onto every floor, into every crevasse, onto all articles of clothing, and to my own personal annoyance, into the heart of every lock of hair. But in my youthful nature, I was heedless of the ubiquitous sand that my feet sank into at every excited prance, slowing me until it seemed that I was in a nightmare where the ocean waited just out of reach because I was simply running in place. Despite the baleful sand, I flopped down on a pastel pink board that was laid on the ground by people in wetsuits. They orbited the board methodically, stopping to congregate around my parents, the perfect contrast to how I had sprinted through the same area. I sat up, not to observe the conversation my parents were holding, I little cared for that. I looked at the other boards that I had neglected. Mine was by far one of the thinnest. Broad boards laid scattered around, interspersed with pink boards like the one I currently occupied. I embraced my pink board, glad for the skinny width and for the color that, being a little girl, occupied its place in my heart as my favorite. 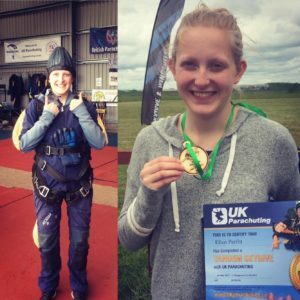 My cheek flat against the board, my hearing aid boring into my head as I wedged it between the surface of the board and myself, I watched with a mild interest as my parents conversed with the people in the wet suits. I raised my head lazily as my mom broke away from the group and neared me, seemingly unperturbed by the pernicious sand. She recounted the conversation as I listened with the same mild interest I had exhibited before. Then, she produced a pamphlet that had been given to her during the conversation. It showed a diagram of a person swimming in the ocean, as I was about ready to be, with arrows in assorted colors, all pointing to illustrate a different current, stroke, or something else I little cared for. My mom explained that the diagram elucidated what to do should I become caught in a rip tide. She asked if I understood. I understood what to do, so I answered with a simple yes. I understood that I should swim parallel to the current, that I should wait out the current, but the sweet innocence I possessed at the time didn’t understand the idea of a riptide. I understood that it was deadly, but I didn’t believe it, not really. I didn’t distrust the advice. I just didn’t attach any weight to it. The only thing that had any allure for me in that moment was the ocean that churned and crashed on the horizon. Excited to wade into the inky blue, I began to pull my hearing aids from my ears, stopping as my mom told me the people in the wet suits would want to talk to us (several other kids had arrived by this time) before we would plunge into the ocean. As far as I was concerned, the only practice I would need with surfing I had already gotten from my neighbor’s old see-saw. I would scramble up on it and tip back and forth until one of my parents came to disengage me from the task that I had set myself to. The lesson came soon enough for my restless soul. I sat with a feigned patience as the instructed explained, as my mother already had, what to do in a riptide. Then they explained how to pop-up. They laid on the board, chest on the rigid plastic, as if to do a push-up. Then, they did push themselves up, springing their legs underneath them and spreading their arms out, so they almost looked as if they were trying to imitate a hawk, circling, circling, circling. I put my arms to either side of my chest, pushed myself up, felt an exhilarating rush as my legs were suddenly there to catch me, and thrust my arms out to the side just as hawkish as was shown to me. They said to do it again, which I readily complied to. Then, we did it again. I soon tired of the exercise, and again yearned to embark on the sea. My instructor came to me introducing himself as Matt. I said “hi” displacently, complaining to my mom that I wanted to go surfing. She looked to the instructor as he said that he was ready to take me out. 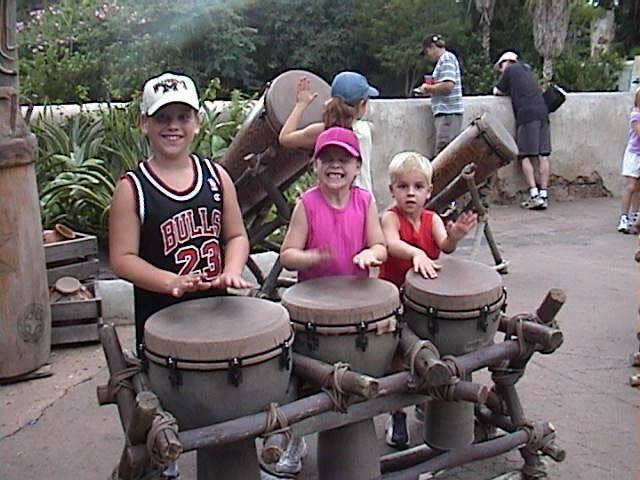 My hearing aids were out before I knew what I was doing. The instructor was still talking, but I didn’t hear. The world was silent. Oh, so peacefully silent! “Go. Go. Go.” I was on my feet as the wave fizzled around my board. The smell of salt nipped pleasantly at my nose. I could taste the rushing sea air on my tongue. The blue was calming. The board was steady beneath my feet. The world was silent. The wave did not crash as it should have on my board. It was oddly fitting. I felt at peace as the coast sped closer and closer. The board began to slow. I toppled off. The brown murk swirled about me when I opened my eyes with a sudden jolt of panic. The sand tickled against my feet. The board passed over me. I felt the panic ebb away as it was replaced with a wonder. Even the board’s shadow was so serene. I loved it. I felt the leash tug me towards the coast much in the way any dog would. The board was no longer over me. My lungs began to burn, so I lifted my head above the water. Another wave came, causing me to stumble for the coast. My instructor waded towards me. Before he could open his mouth to utter a sound, I was imploring him to do it again. He made a comment to my parents that I did not hear. 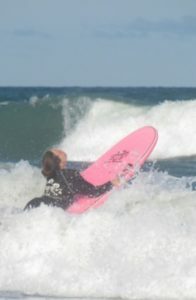 As I scrambled on the board, I didn’t care about anything except surfing again. And so, we did. Every time he made a comment that I didn’t hear. I wasn’t bothered by this. In the past, anytime I had insisted to know the dialogue I found myself strangely disappointed. I didn’t know that he was impressed at my eagerness to do it each time. I still don’t know what my parents said in reply, but I do know the silence as I stood was amazing, refreshing as I smelled the salty air that can only be found on the sea. Without the sound, I had nothing to focus on but the amazing calm that only came when the sea raged around me, propelling me swiftly forwards. I didn’t mind not hearing. Even just for that moment, I was glad for it. And I never did encounter a rip tide. 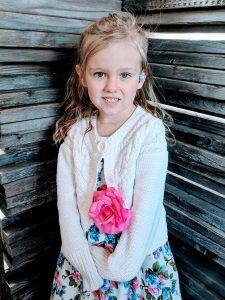 Julia Resciniti was diagnosed with moderate sensorineural hearing loss just before her third birthday. She’s currently in seventh grade at her neighborhood school where she’s been on high honor roll every marking period. Julia enjoys reading, sewing, and listening to music. 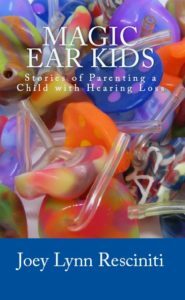 Julia is the subject of her mother’s book about parenting a child with hearing loss, Magic Ear Kids, available in print and kindle editions from amazon.com Magic Ear Kids.